The experiment asked the participants to preform certain tasks around that pit, while their heart rate, galvanic skin response and skin temperature were measured. By doing so, the researchers hoped to develope a quantitative measurement of how immersive was the AR experience. Sadly, they don't report on their results yet, but you can tell from the video that some participants were shaken by the event. Next time, they'll confront volunteers with an approaching virtual train and have paramedics on stand-by. Georgia Tech's has a new infomercial for their mixed reality design class. Geocaching using augmented reality is such a neat idea, I'm surprised no one before Jacob at Trimagination thought about it. Geisha Tokyo Entertainment's ARiS, the augmented reality maid featured in the clip above that Ori covered here, is on her way to become the first virtual AR celebrity. No only does she appear in primetime tv, she now got her own book deal. The new "official guide book", is 64 pages of ARiS goodness. It features ARiS's secret till now biography, tips and tricks, her development process and an interview with her voice actor. Apparently, also included are some markers for ARiS's living room and shower so after buying the book she will no longer need to live on your desk. You can see a video of her new rooms at the book's site. Alas, you can order the book only if you live in Japan. It will be available starting from early June. Via CScout Japan, where you can find some more details and pictures. Some clever guys from Oslo School of Architecture and Design are behind this prototype, a simple media player that play clips according to the ID of object it senses. Of course, enhancing mobile phones with RFID readers is not a new concept, and Nokia is very active in this area, but as many things do, it looks sexier on the iPhone. Overall the demo points towards opportunities around the distribution of media through physical objects, it is an example of general ideas around an ‘internet of things’ or ‘spimes’ applied to the world of media. What opportunities would the distribution of RFID-embedded products open up in terms of media, gaming, services and marketing? What does this mean for the future of products? Here's an interesting interview held this February with Tim O'Reilly, the man behind O'Reilly Media, who is most associated with the Web 2.0 movement. RFID is an evolutionary dead-end ... semantic web or RFID is things "wearing name-tags", and web 2.0 is learning to recognize things ... We're getting to that kind of augmented reality, where our computers will have senses that are as good as ours or better ... they are going to recognize faces, they are going to recognize objects, they gonna have immediate recall. If you ask me "what's the UI in five years", it's a pair of glasses ... I'm gonna have some kind of little heads up display because I'm gonna look at something, I'm gonna walk around at a meeting and it will go "that's Joe, you met him three years ago". What Revolution Will Come Out of this Recession? I stole the next graph from Michael Tamblyn's very interesting talk "6 Projects That Could Change Publishing for the Better". You can find his slides here, and see a recording of his talk here. The black line is US (?) unemployment rates since 1960. The colored columns mark recessions in that period, the last column marks our current recession. 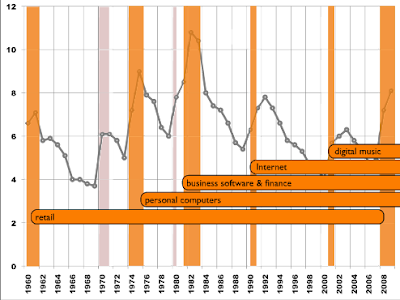 As you can see, each recession, apart from the one in the early 70's, gave birth to a new social/technological revolution. Of course, this graph is biased (as Tamblyn himself mentions). It doesn't cover technological revolutions during periods of growth, and it doesn't mention failures. Keeping this in mind, let's assume for a minute that some paradigm change will come out of this recession, will it be augmented reality? 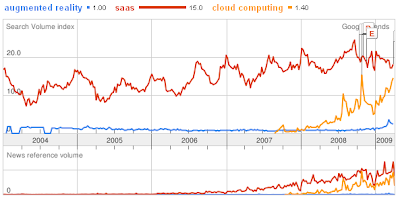 AR increase in search volumes seems puny relative to the dramatic increase in searches of "cloud computing". The same goes with news references. Yet, I'm still optimistic. AR is still in its infancy. AR is at a stage where cloud computing was two years ago. Most people still think of it as a cool novelty and don't get the many possibilities it creates. Let's check back in two years and look at the graphs once more. If augmented reality can show the same growth as "cloud computing" did, it could really be the revolution that came out of this recession. Actually, it's probably another April Fools joke (see a better one, here). When you try it out (which I didn't, of course), you get an arrow pointing to your face, and some insulting text in Japanese directed at you. Though I guess there's a real market for such a product (I can think of some spam letters that can use this technique to let you see how you would look like after lengthening a specific body part). Sergey Ten explains "Why 3d markerless tracking is difficult for mobile augmented reality"
The New York Times on the future of sales kiosks - "Consumers can walk up to the kiosk, swipe a barcode for a foundation cream, and see how it looks on the onscreen image of their faces." A new video from the Artvertiser - augmenting a postcard. A new Augmented Reality Twitter group. Get ready to be spammed. Augmented Reality Modelling Tool from melka on Vimeo. I've finally dug-up some information about how Alcatel-Lucent "Enhanced Reality" solutions (which we previously discussed here and here) work - the secret is video calls. When a user "scans" an image (in the above case, a movie-poster) she actually video-calls Alcatel-Lucent and transmits her camera input to its servers. Alcatel-Lucent's servers try to match the incoming image to known "augmented" images, and sends back information, a ringtone, or in the case above a video stream back to the user. Obviously, this technique requires a very fast network connection (especially for a "textured effect" as seen in the embedded clip), and may be difficult to scale. However, at least in lab conditions, it looks wonderful. Box trainers provide realistic ‘haptic feedback’ (the sensation and resistance of actual tissue) but do not provide an objective assessment of skills. 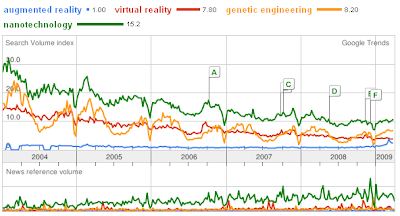 VR simulators do give an objective assessment but lack the realistic haptic feedback. Unfortunately, it's hard to tell from the press release what exactly did Botden change in the ProMIS simulator. Browsing through ProMIS's site, it seems that it was previously designed to use AR as a method for training for surgeries, even laparoscopies. See for example the following video (some virtual blood is involved), where the simulator guides the trainee through the procedure. Nevertheless, ProMIS seems like a very cool device, and I can only wonder what are type of precisions involved tasks can be learned using AR. SPOILER ALERT - do not read on, if you don't want to spoil yourself the surprise, though this is one is a pretty obvious hoax. int13 brings us the best augmented reality related hoax ever*! * And probably the first one ever, as well.